Cryogenic Equipment Market size was valued over USD 15 billion in 2017 and is predicted to grow over 7% by 2024. Ongoing investments toward the expansion of existing manufacturing facilities coupled with supportive government policies across emerging economies will drive the global market growth. Furthermore, rising Foreign Direct Investment (FDI) inflows coupled with increased domestic investments toward the establishment of new industrial facilities will boost the product adoption. Ongoing efforts to reduce GHG emissions driven by increasingly stringent legislative requirements will fuel the global market growth. For instance, the European Union has set a target to reduce GHG emissions by 40% compared to the 1990 levels by 2030, thereby leading to an increased use of cryogenics from natural gas. In addition, rising number of projects of integrated gasification combined cycle, clean coal and gas to liquids processes are contributing to the industry growth. Cryogenic tanks, in 2017, accounted for over 40% of the global market share. Ongoing technological advancements, most notably the development of spray-on foam insulations and cryogenic grinding (cryo-milling) will positively influence the product penetration. Furthermore, increasing storage requirement for liquefied gases across several application areas will stimulate the industry growth. 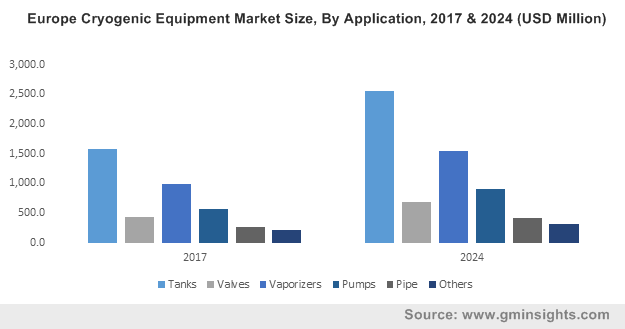 Cryopump market size will witness strong growth on account of increased usage of gases across healthcare facilities along with rising investments across oil & gas and electricity sectors. In addition, availability of different designs for various applications including bath cryopumps, refrigerator-cooled, supercritical helium-cooled, and novel cryogenic pump will complement the business landscape. Natural gas based cryogenic equipment market size is set to expand over 7% by 2024. Abundant Availability of natural gas, majorly across Argentina, China, and the U.S. favored by abundant untapped reservoirs will fuel the industry growth. Moreover, the increasing demand of LNG on account of its widespread requirement across the power and oil & gas sector as a feedstock, will foster the product adoption. Nitrogen based equipment, in 2017, accounted for over 25% of the global market share. The equipment’s wide-ranging application across chemical, food & beverage, healthcare, and metal industries will drive the business growth. Furthermore, growing E&P technologies including enhanced oil recovery and well hydraulic fracturing will drive the product penetration owing to its application as an injection fluid. Cryogenic storage equipment market share will expand over 7% by 2024. The industry growth is attributed to rising demand for sourcing, stocking, handling and transfer of liquefied gases. The ability of these equipment to store liquefied gases at extremely low temperatures represents one of the major factors which will drive the product adoption. Cryogenic distribution equipment market size will witness appreciable growth on account of increasing trade of liquefied gases including helium and LNG coupled with cryogen’s extensive industry penetration. Oil & Gas industry, in 2017 accounted for over 25% of the global market share. The increasing requirement to augment oil output from techniques including enhanced oil recovery and hydraulic fracturing will stimulate the demand for these products across the sector. Furthermore, technological advancements for the exploration of unconventional oil and gas resources including tight gas, tight oil, shale gas, and coal bed methane will fuel the industry growth. 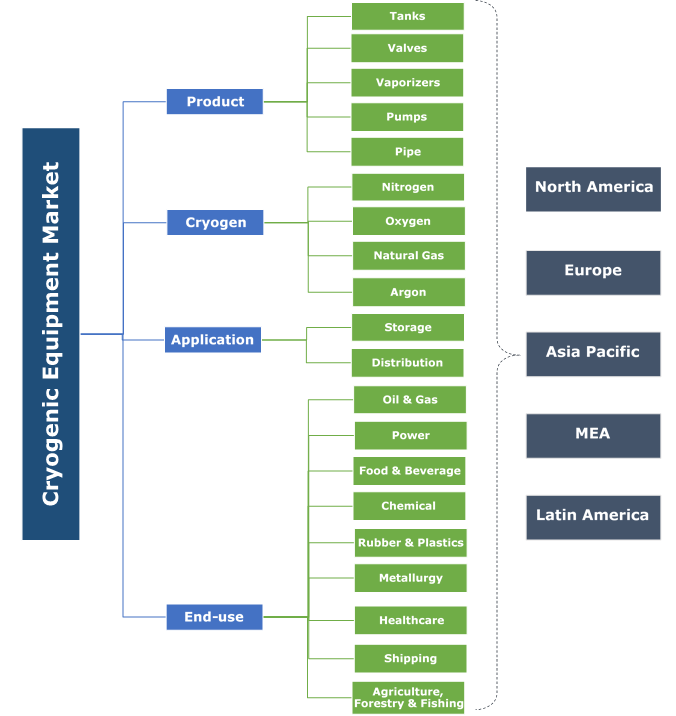 Healthcare cryogenic equipment market size will grow owing to the continuous investments toward modernization of existing hospitals coupled with improving service portfolio. For instance, in the U.S., healthcare spending witnessed a considerable growth of 17% from 2013 to 2016 amounting for over USD 3 trillion. The U.S. market will witness strong growth owing to the increasing natural gas liquefaction capacity in the country favored by sizeable investments in new E&P ventures. The country has introduced five new projects including Cove Point, Cameron, Corpus Christi, Elba Island, and Freeport, which are anticipated to increase the total U.S. liquefaction capacity to 9.5 Bcf/d by 2019 from 1.4 Bcf/d in 2016. China market is set to surpass USD 4 billion by 2024. Growing manufacturing sector favored by ongoing investments in the expansion of existing units will stimulate the business growth. In 2017, manufacturing value added contributed over 29% of the overall GDP in the country. Furthermore, in 2018, China unveiled a long-anticipated easing of foreign investments curbs on different sectors including power grids, automotive, heavy industries, banking, and agriculture. Eminent industry players across the global market include Chart Industries, Emerson Electric, INOXCVA, Cryostar, Wessington Cryogenics, Linde Group, Praxair Technology, Air Liquide, Air Products and Chemicals, Graham Partners, Technifab Products, Ebara, and Nikisso Cryo. Key industry participants are consistently focusing toward mergers & acquisition to sustain and reinforce their position in the cryogenic equipment market. For instance, Chart Industries, in 2018, acquired Skaff Cryogenics & Cryo-Lease, LLC with an aim to expand its regional presence across the U.S. for service and aftermarket support for cryogenic storage equipment. A cryogenic equipment maybe defined as an equipment that is deployed for the storage, transportation and distribution of cryogenic liquids. The cryogenic liquids are the liquefied gases with a normal boiling point below -90oC. Adequate insulation is the significant feature of cryogenic components, which ensure the proper regulation of temperature levels within the equipment.